Munster have made 11 changes to their team that defeated Cardiff last weekend as they head to Italy to face Benetton on Friday at 7pm. Munster know that they need a win to keep the pressure on Glasgow at the top of the table and stay in the hunt for a home semi-final. Mike Haley, Darren Sweetnam, Billy Holland and Chris Cloete are the only players to keep their places in the starting team from last week. Jeremy Loughman, Rhys Marshall and Stephen Archer make up the front-row as Archer is set to make his 150th Pro 14 appearance. Fineen Wycherley partners captain Holland in the second-row, with Jack O’Donoghue, Chris Cloete and Gavin Coombes behind in the back-row. Coombes is set for his debut. Alby Mathewson starts at scrum-half, alongside JJ Hanrahan in the half-backs, who is set to play his 100th match for the reds. Outside them are Dan Goggin and Sam Arnold in the centre pairing. Shane Daly is on the left-wing, another ready to make his first start, with Darren Sweetnam on the right and Hike Haley at full-back. Their bench is largely inexperienced with academy player Alex Henry, yet another ready to make his debut for the club among them. Speaking ahead of the game Munster head coach Johann van Graan, who signed a new contract extension during the week, has complimented the opposition and their style. “They’ve been excellent. The conference system sets up knock-out rugby pretty well and they play knock-out rugby,” he said. On other side Benetton have made one change to the team that secured a dramatic away draw at Leinster last weekend, with Tommaso Benvenuti coming in for Luca Morisi. Otherwise it’s as you were. 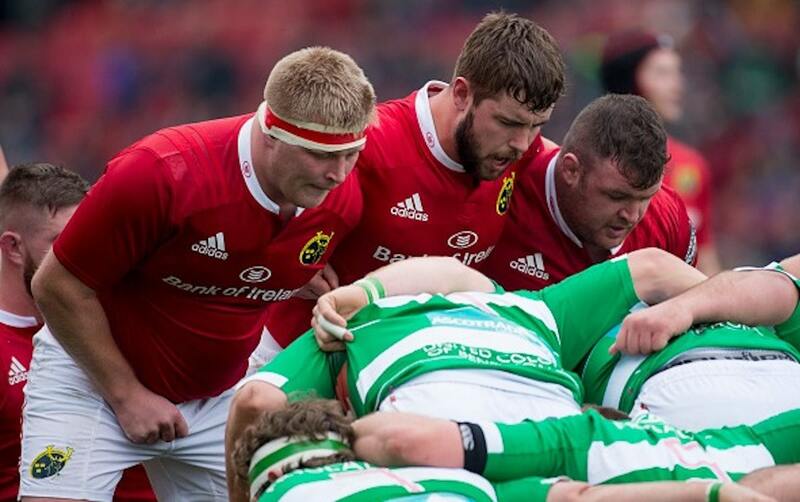 A win for Munster is crucial in the race to stay in touch with Glasgow at the top of Conference A, but Benetton are in the play-off positions in Conference B and will want to stay there, so this could be a battle worth watching.